AEI’s self-contained pellet systems are completely pre-wired and piped, arranged in a module ensuring ease of site installation and rapid commissioning and startup operation. Manufactured in all stainless steel, our Rotary Fryers are designed to meet the highest standards … yours! Extremely low oil volume in Fryer means quick oil turn over for fresher products which will taste better and last longer on the shelf. 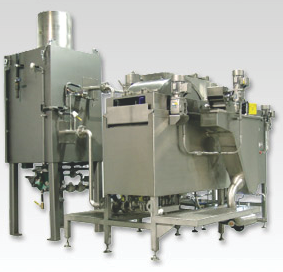 Multi-purpose design allows for frying a wide range of buoyant food products with varying cook times. Robust pan design having multiple adjustable inlet manifold pipework and common oil take out pipe. Rotary product control drum with specially designed flight compartments for precise timing control through oil bath and flawless product ejection.